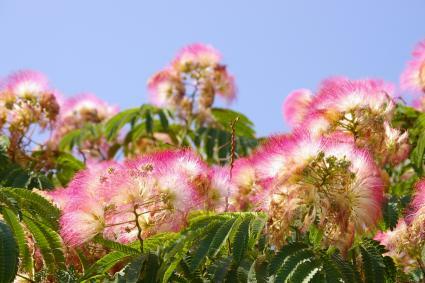 Mimosa (Albizia julibrissin), also known as the silk tree, is a medium-sized, fast-growing shade tree with a dazzling display of puffy pink flowers each summer. Take its vital information into account to see if it might be a good fit for your next landscaping project. Mimosas can eventually reach 50 feet in height, but are more commonly seen in the 30 to 40 foot range. They grow faster than almost any other shade tree and have unique flat-topped canopies that are typically as broad as the trees are tall. Up close, mimosa has soft, silky, almost fernlike foliage, comprised of many tiny oval-shaped leaves arranged together to form the bigger leaf-like structures that appear as leaves when viewed from afar. The foliage is resplendent during the growing season, but tends to hang on to the branches after it turns brown in fall, giving the tree a bit of an unkempt appearance in winter. 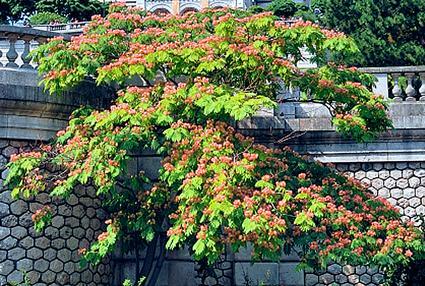 The small fragrant flowers appear in early summer and completely cover the canopy of the tree. One of the most magical things about mimosa is how the flowers fall to the ground carpeting the earth with bubble gum-colored petals. The seeds of mimosa develop in flat, slender bean pods about 3 to 4 inches in length. These tend to stick around through most of the winter together with the leaves, adding to its scraggly appearance at this time of year. One of mimosa's greatest attributes is it adaptability to a wide range of growing conditions. Mimosa grows in USDA plant hardiness zones 6 through 9, meaning it tolerates winter temperatures as low as -10 degrees. It is a heat-loving tree, so there is almost nowhere that is too hot for it to grow, except in scorching desert environments. Mimosa is a sun-loving tree, though it can tolerate shade when young if it has the opportunity to grow up into the light. It is extremely adaptable to soil type - sandy soil, heavy clay or anything in between is fine, as long as it is not in standing water. It is one of the most drought tolerant shade trees, growing happily in dry, rocky soil with little or no supplemental irrigation. As a tough-as-nails tree, mimosas require little in the way of care. They do not need fertilizer, but appreciate a soaking now and then during a heat wave, though they will survive on their own without. Mimosas naturally take on a pleasing from, reminiscent of trees on the African savanna, so pruning generally isn't necessary, unless there are damaged or diseased branches that need to be pruned. Typically, the only type of maintenance that is needed with a mimosa is to rake up the prolific drop of flowers, leaves and seedpods as they fall throughout the year, especially if the tree hangs over a driveway or patio area. Mimosa is quite resistant to pests and disease, though there are a few that can show up on occasion. Nectria canker occasionally attacks mimosa trees, which is evident by the pinkish-red growths that appear on the branches as they shrivel and die. There is no feasible way to combat the disease, so it is best to control it by pruning the affected limbs well back into healthy wood and disposing of them. Fusarium wilt is a much more lethal disease that affects mimosa trees in some areas. The symptoms appear quite suddenly and, unfortunately, there is no way to stop it. The leaves begin to yellow and wither progressively throughout the tree, which typically dies within a year. The biggest potential problem with mimosas is that they grow a little too well for their own good. Their tremendous adaptability and fast growth rate makes them a weedy species in many areas. They spread themselves readily by seed and can pop up all over the yard, not to mention in natural areas where their presence can displace native species. Plus, removing the tenacious sprouts from flower beds can be a major chore. If seedlings do appear, try to pull them before they are more than a foot tall as the taproot is difficult to extract once they get any bigger. There are a few named varieties of mimosa, bred for both ornamental and practical purposes. Union, Tryon, and Charlotte have been bred for resistance to fusarium wilt, but are not widely available in nurseries. Unfortunately, there are reports that the disease may be overcoming resistance in Tryon and Charlotte. Rosea, also known as Ernest Wilson, has brighter pink flowers than the regular species and stays smaller, growing to only 10 or 15 feet in height. Alba is a white-flowering species. Summer Chocolate has spectacular reddish-brown foliage in summer. Mimosa is a short-lived tree, often surviving for only 10 or 20 years, but is incredibly useful where its fast-growing ability is needed. Its picturesque form makes it a perfect focal point in the landscape and it is small enough to be considered for use as a patio tree. If you're thinking of planting a mimosa, check with a local nursery to see if it is considered an invasive species in your area. If not, it's a great choice for it spectacular flower display and ornate growth habit.